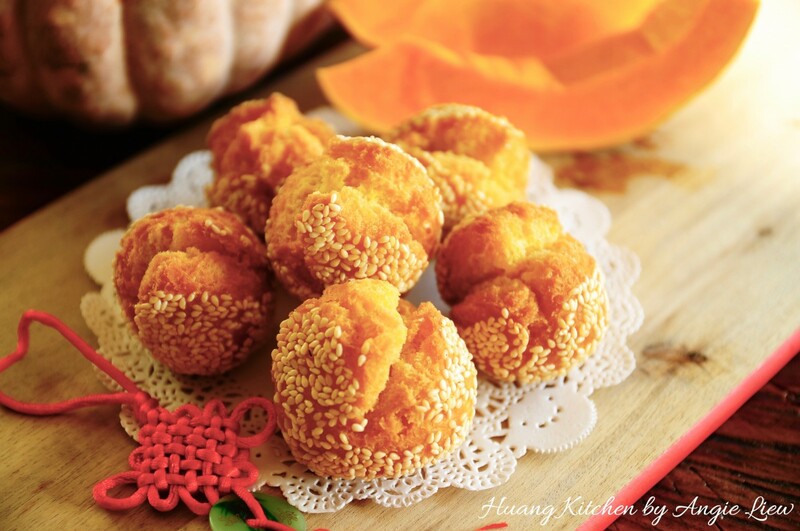 Chinese or Lunar New Year is the most important festival celebrated throughout many Asian countries and the celebration just isn’t complete without Chinese New Year goodies and cookies. 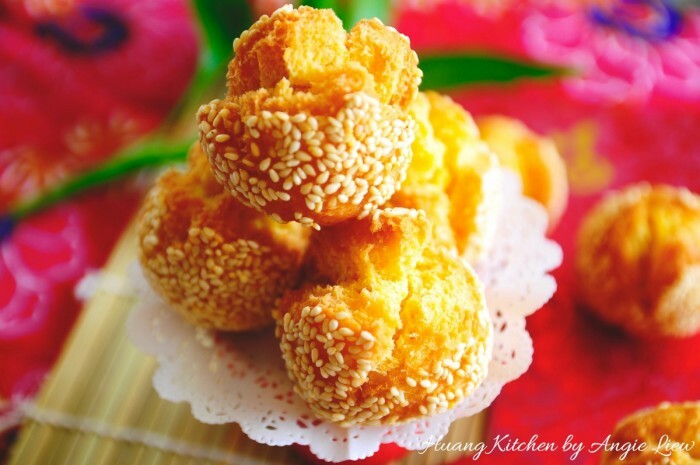 Every cookie served during Chinese New Year has a meaning and usually the names are associated with some Chinese words or appearance that represent happiness, prosperity, good luck, good health or anything auspicious. 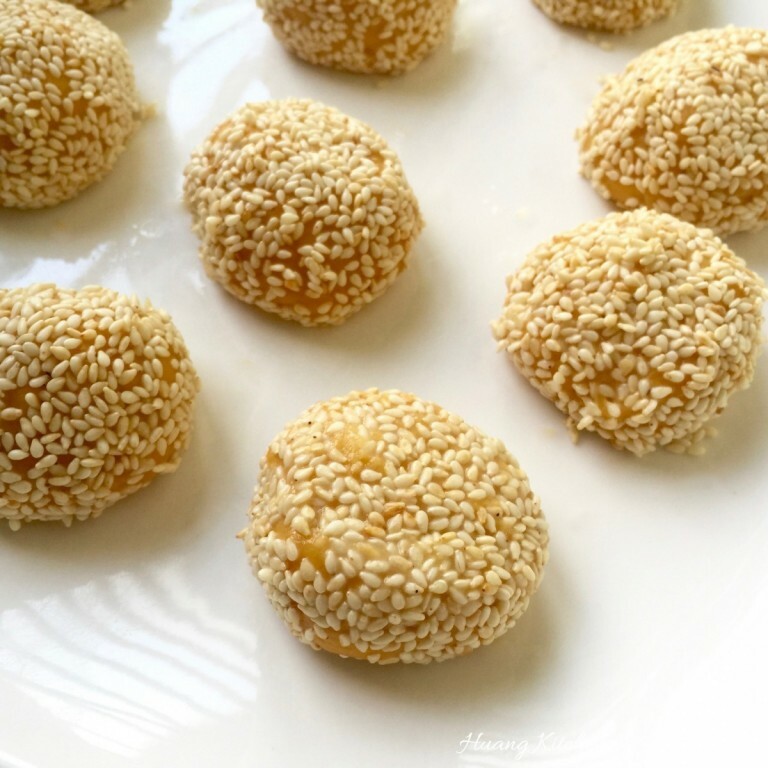 Sesame Cookie Balls, better known as laughing or smiling sesame balls are no exception. 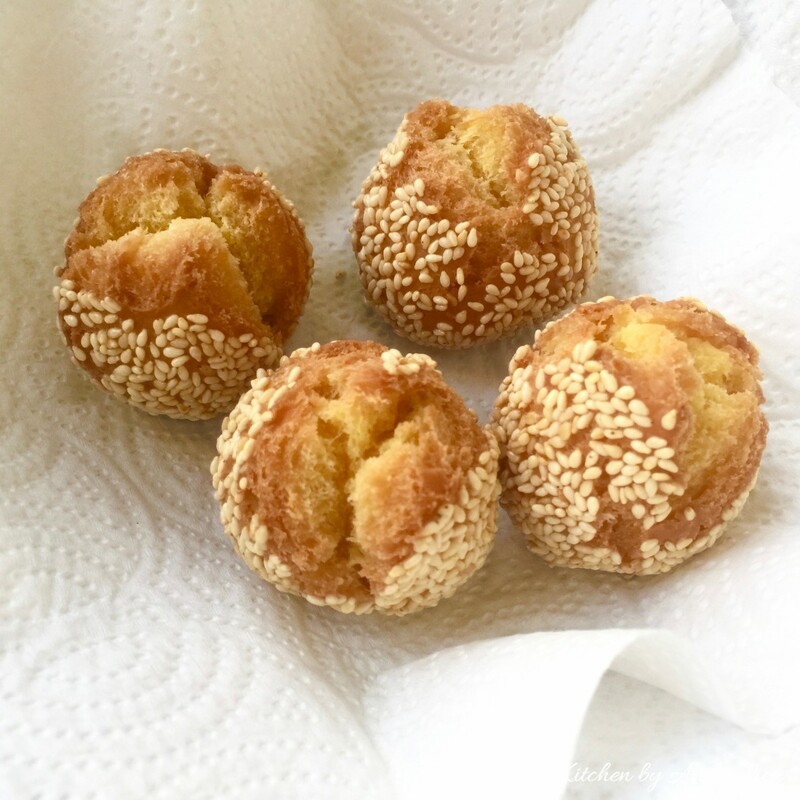 The natural cracks on these sesame cookie balls when deep fried, resemble smiling faces, hence the name smiling sesame cookie balls. 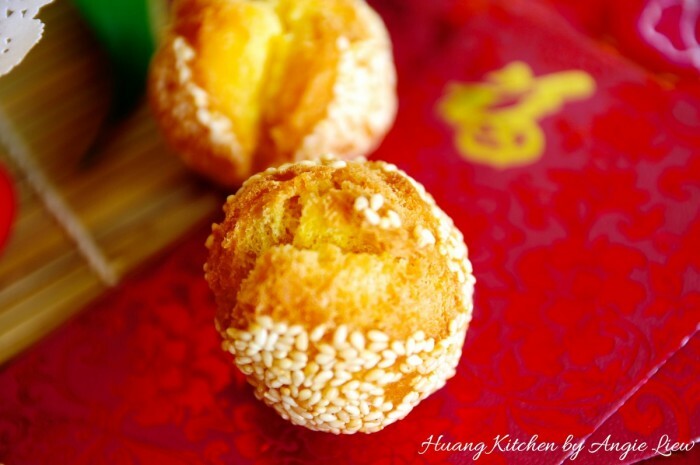 These traditional Sesame Cookie Balls are served during the New Year to symbolise happiness and laughter, which is why they are a New Year tradition. It also means eating them during the Chinese New Year bring lots of laughter to you and the family and the year that follows will be a very happy one with full of smiles and laughter too. 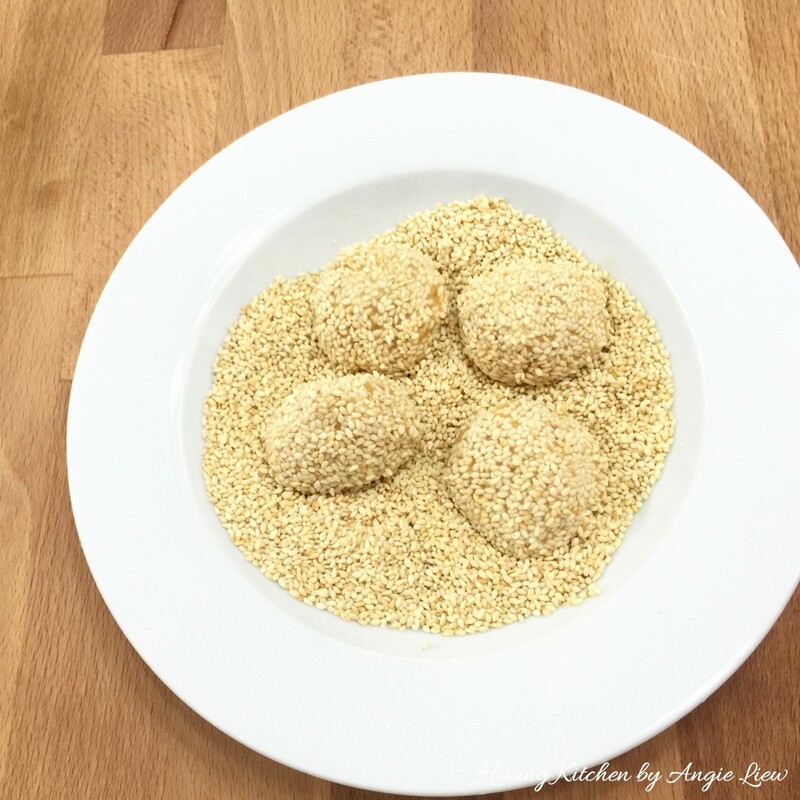 In short, making these smiling sesame cookie balls bring EXTRA smiles for the New Year. 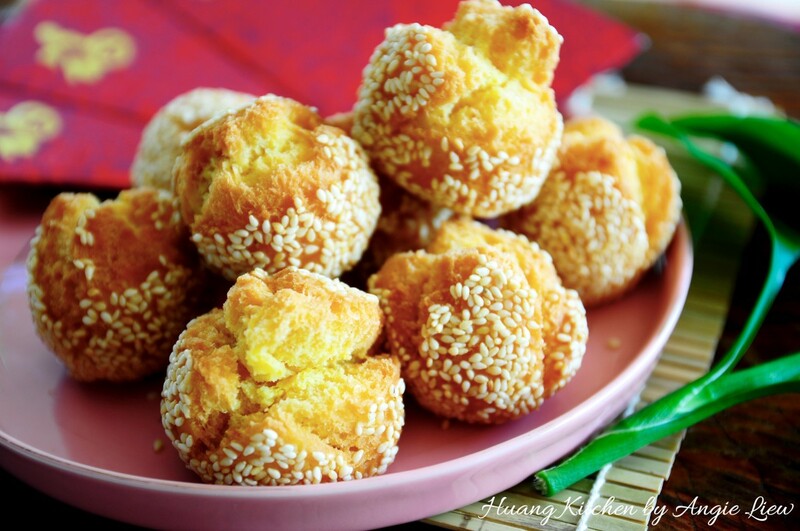 These crunchy and delicious sesame cookie balls are usually served as a snack before dinner during Chinese New Year. 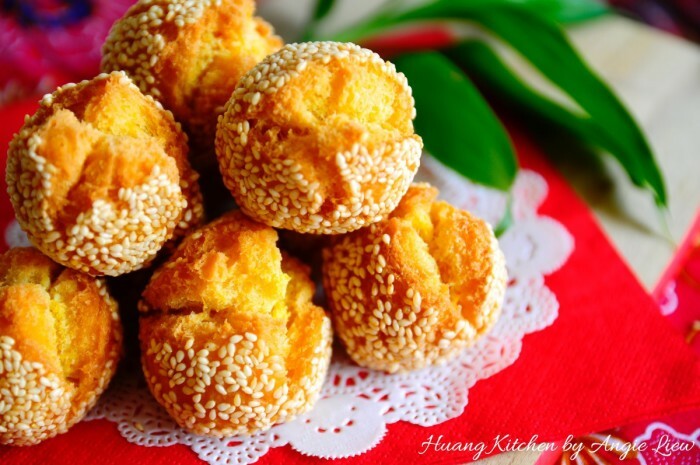 Sesame Cookie Balls are actually deep-fried cookie balls rolled in sesame seeds. They are golden in colour as pumpkin paste is added to enrich the colour. Sesame cookie balls are crunchy on the outside and pillowy soft on the inside. Not only are they delicious and ridiculously addictive, they are super easy and quick to make too. 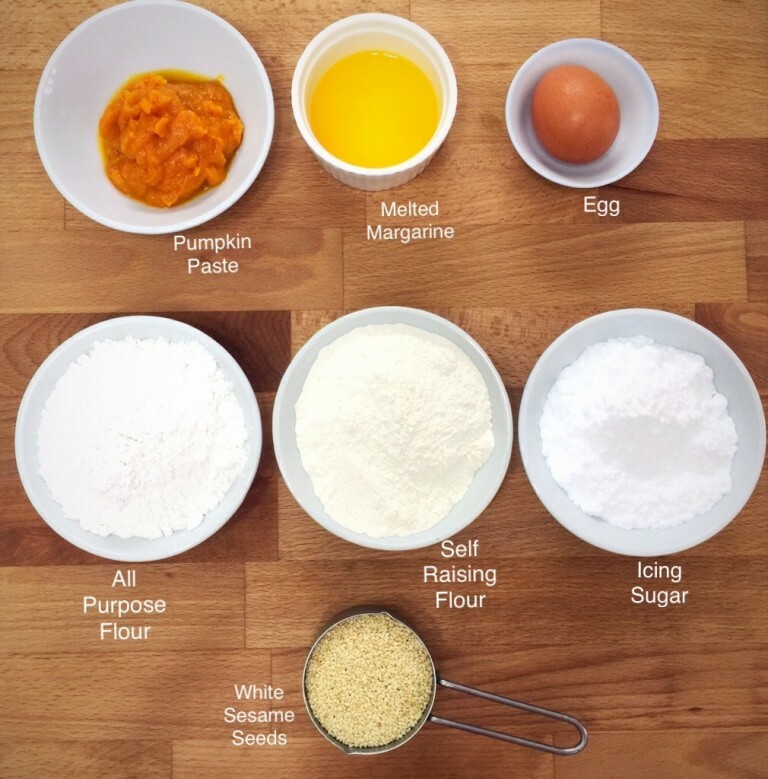 To make these cookie balls, just combine well the DRY flour mixture into the WET egg mixture to form a smooth dough. Then form the dough into small balls, coat well in sesame seeds and deep fry over low heat. You should then notice cracks or smiles appearing around the Sesame Cookie Balls. And we’re done! 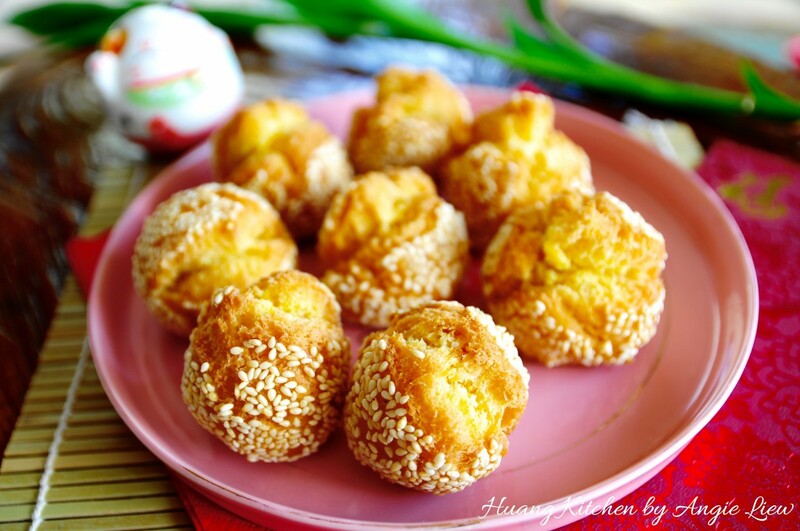 Sesame Cookie Balls are actually deep-fried cookie balls rolled in sesame seeds. They are golden in colour as pumpkin paste is added to enrich the colour. Sesame cookie balls are crunchy on the outside and pillowy soft on the inside. Not only are they delicious and ridiculously addictive, they are super easy and quick to make too. First, prepare all ingredients needed to make the sesame cookie balls. Sift all the DRY ingredients and set aside for use later. 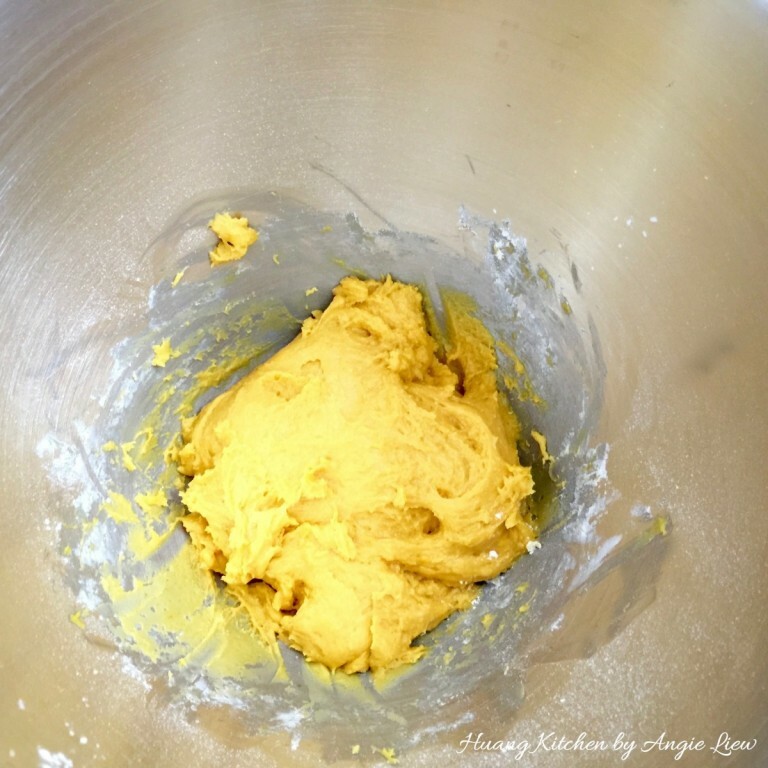 Then in a large mixing bowl of a stand mixer, add in the WET ingredients. 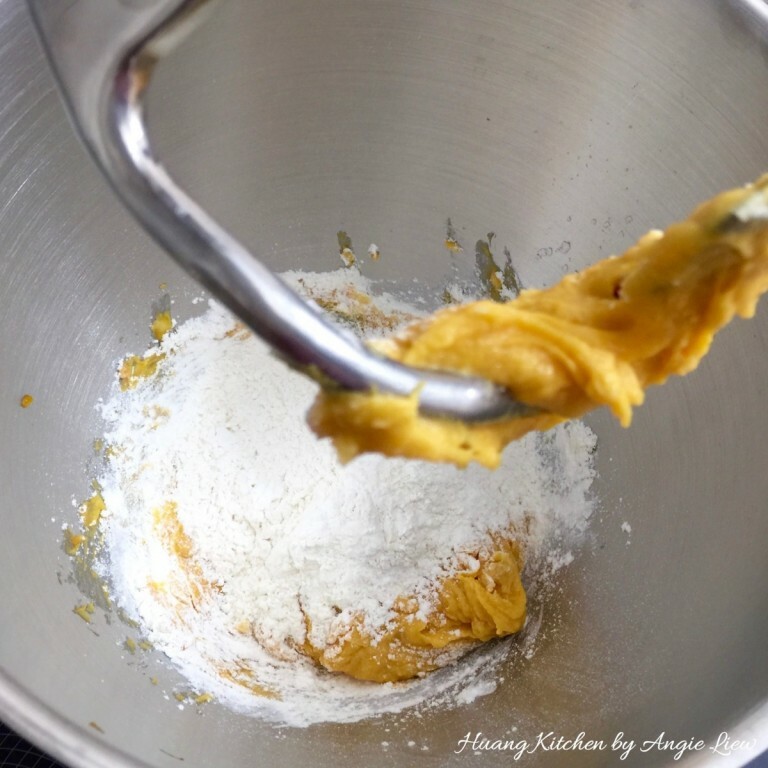 Use the dough hook to mix well. Next, add in the sifted DRY ingredients. 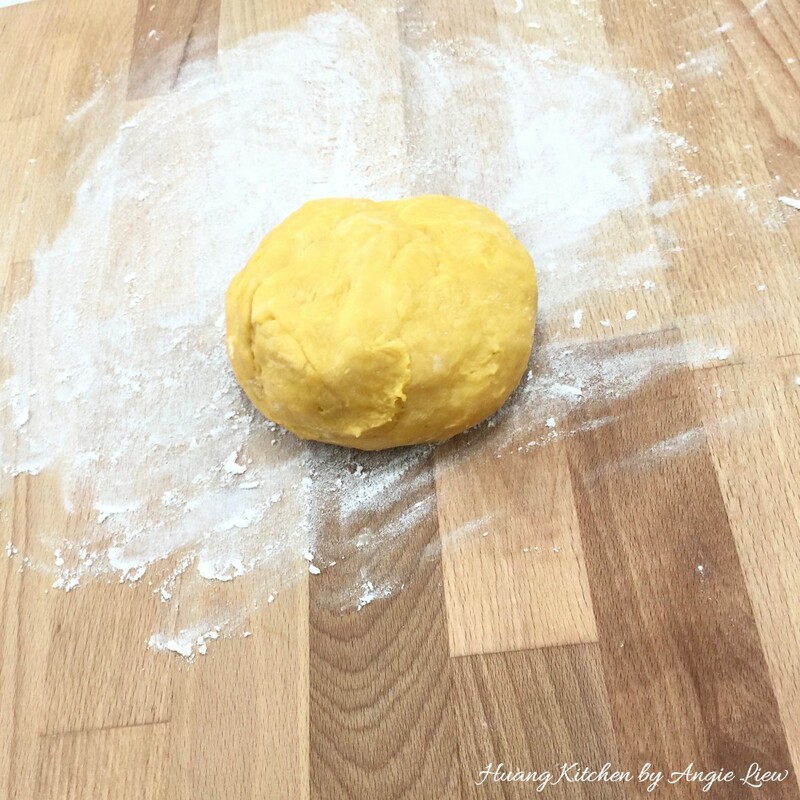 Still using the dough hook, knead the mixture into a soft dough. 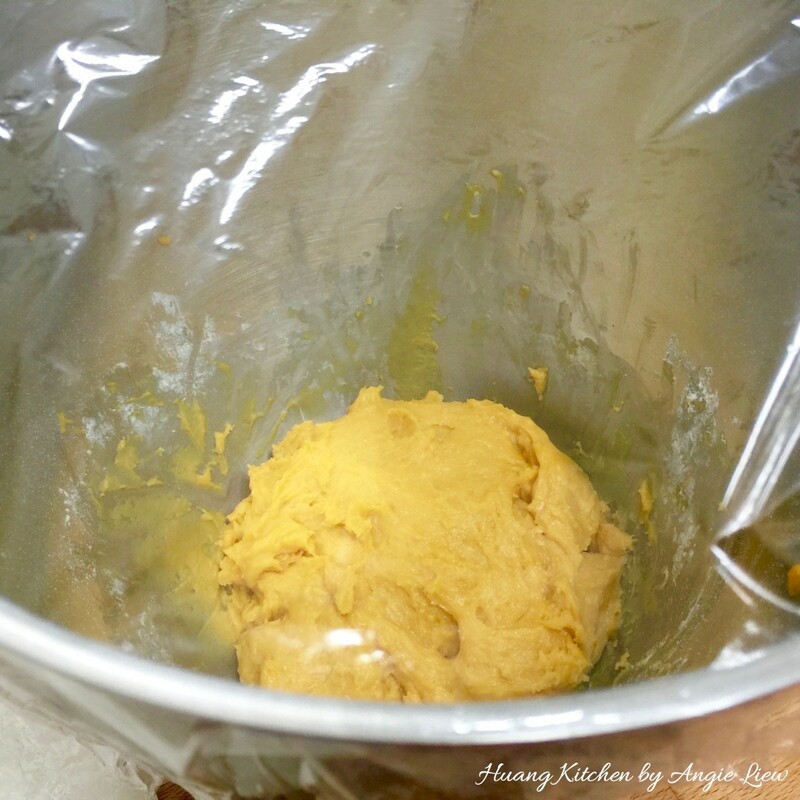 Remove the dough from mixer, cover the mixing bowl with cling wrap and chill in refrigerator for 1 hour. 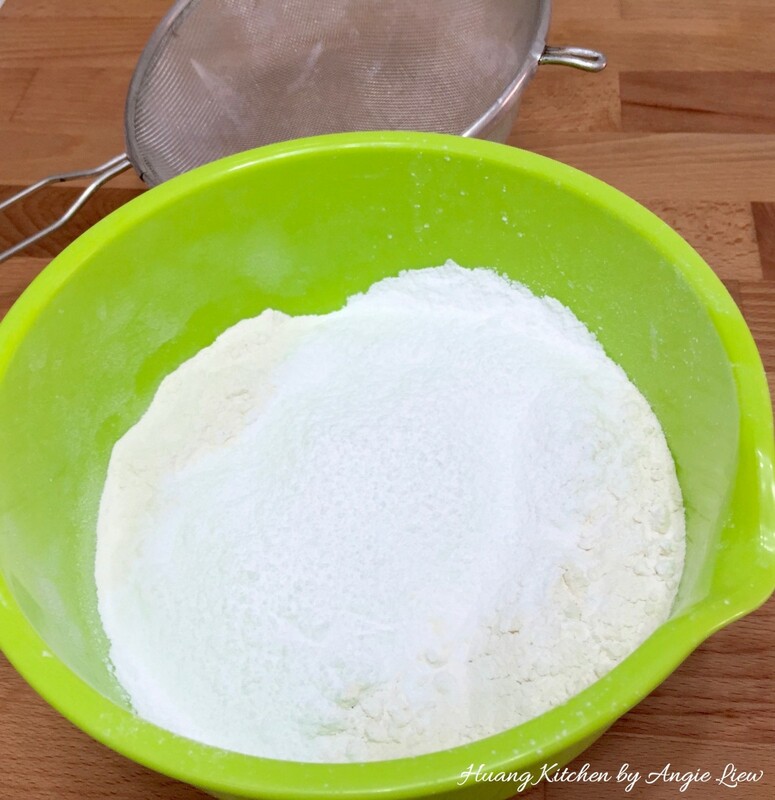 Place the chilled dough on a floured working surface. 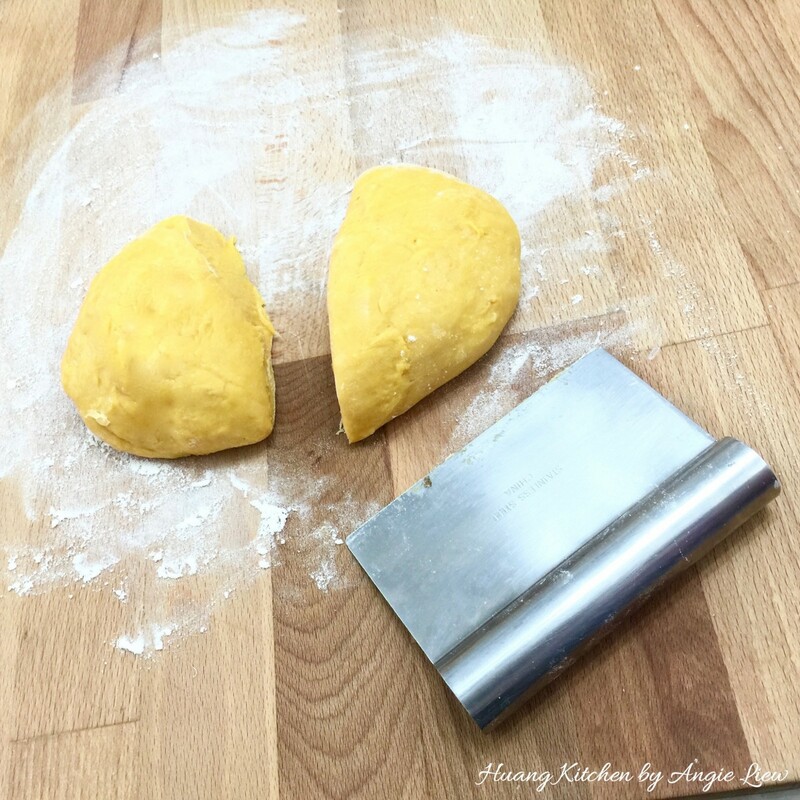 Divide the dough into two equal halves for easier handling. 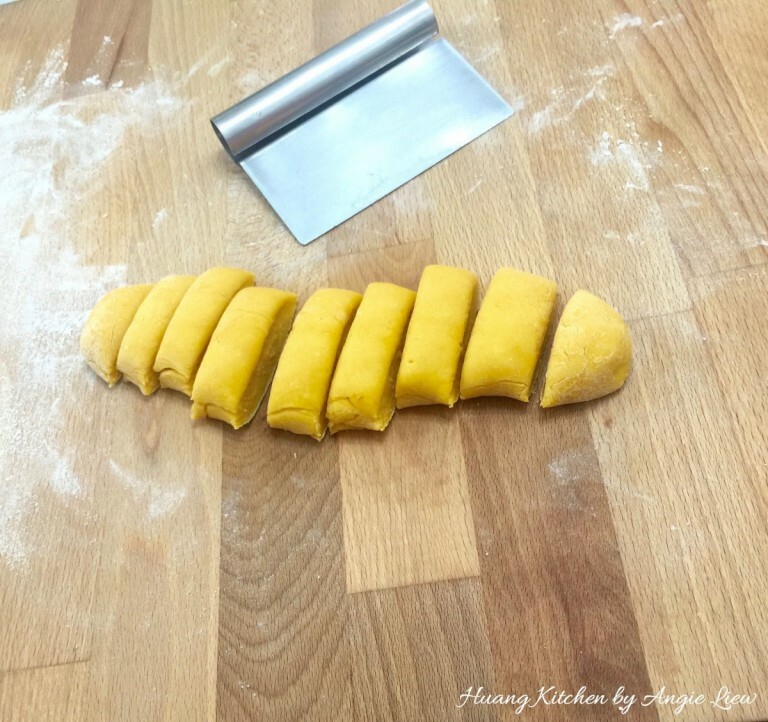 Roll each half of the dough and cut into small pieces, about 1.5 cm each. You should have 9 pieces. 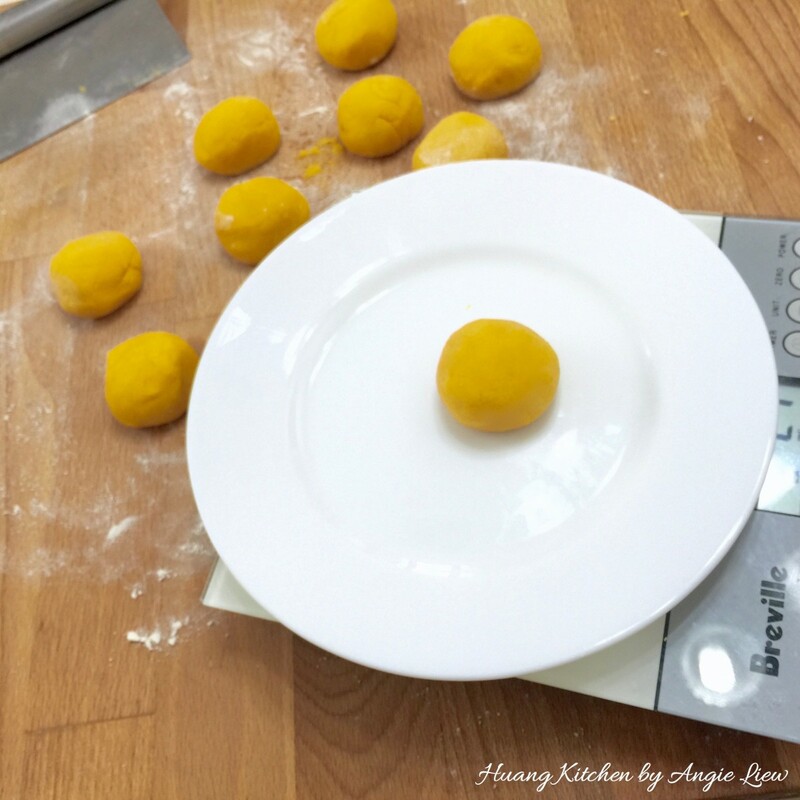 Weigh each cookie ball (25g) to ensure they are of the same size. In batches, place the rolled balls into a sieve and dip them briefly into cold water. Shake off excess water and roll them in the white sesame seeds. Repeat the same for the rest of the cookie dough. Roll them lightly again before frying to ensure the sesame seeds stick to the cookie balls. 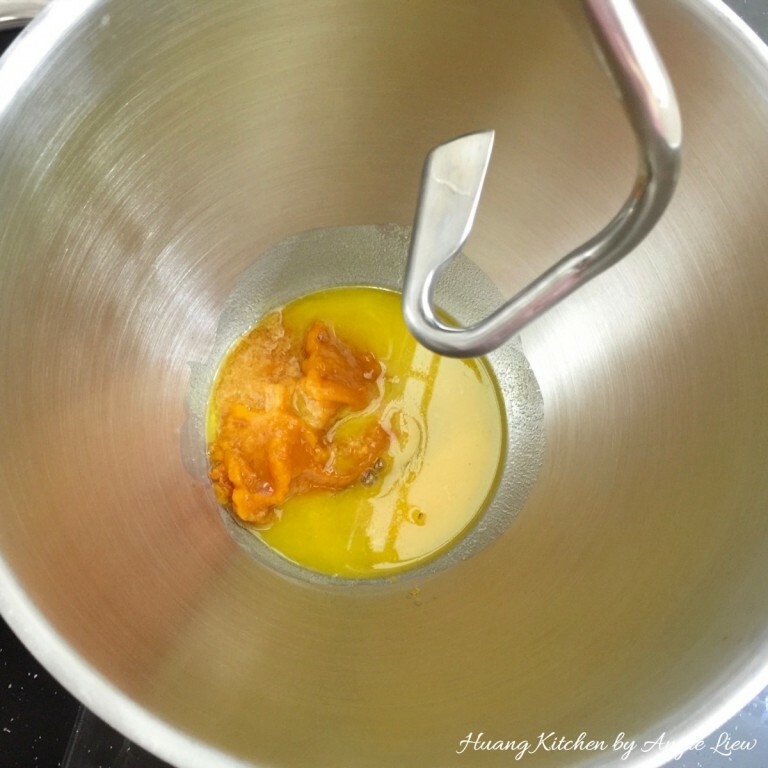 In a large pot or pan, fill with about 2 inch of vegetable oil. 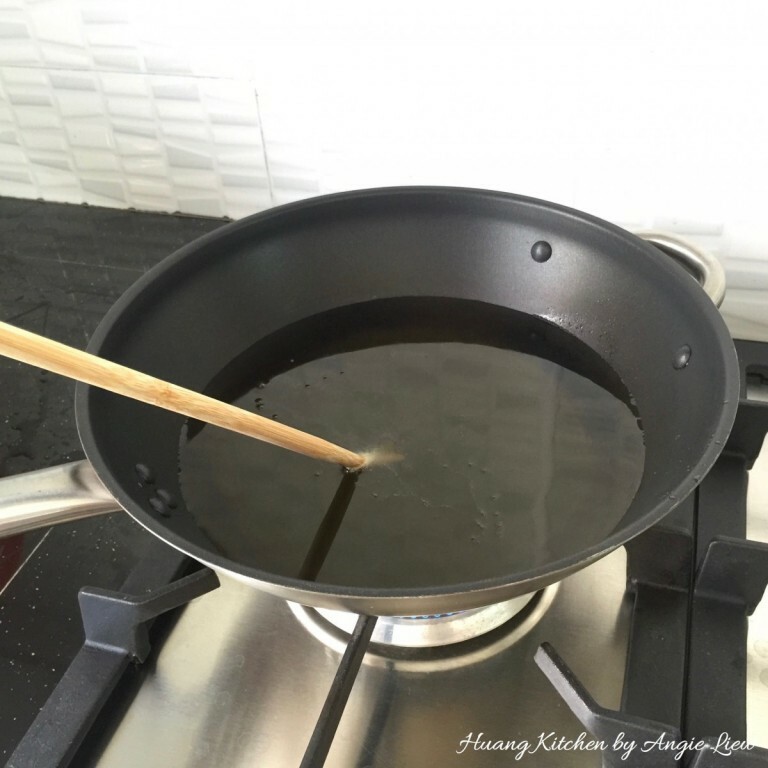 Heat until hot and bubbles appear at the tip when a wooden chopstick is dipped into the oil. In batches, add in the sesame cookie balls into the hot oil. Then bring the temperature to medium low and fry the dough for about 10 minutes or until the balls crack and are about golden brown in colour. 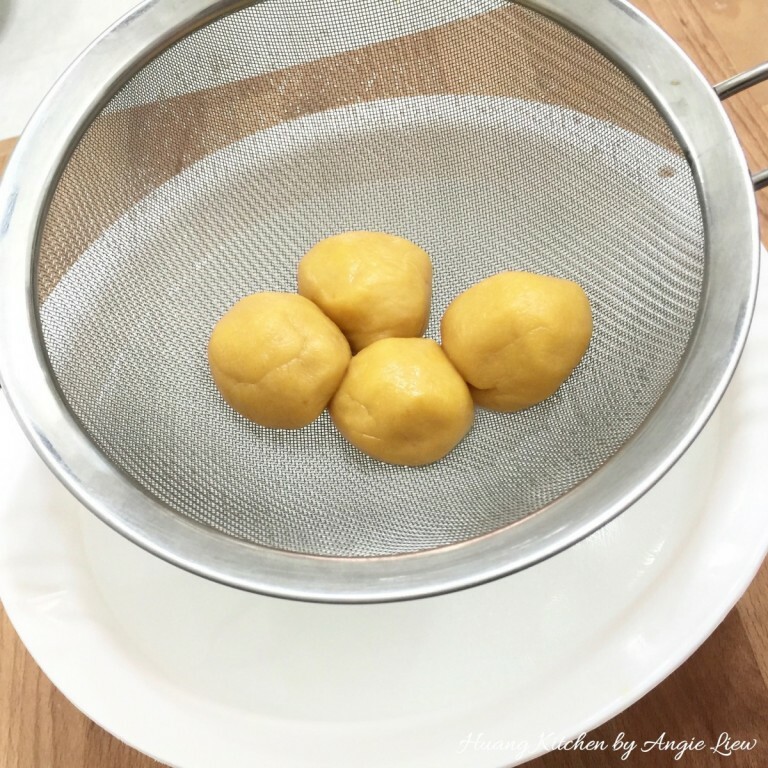 When done, remove the dough balls from the oil using a strainer. 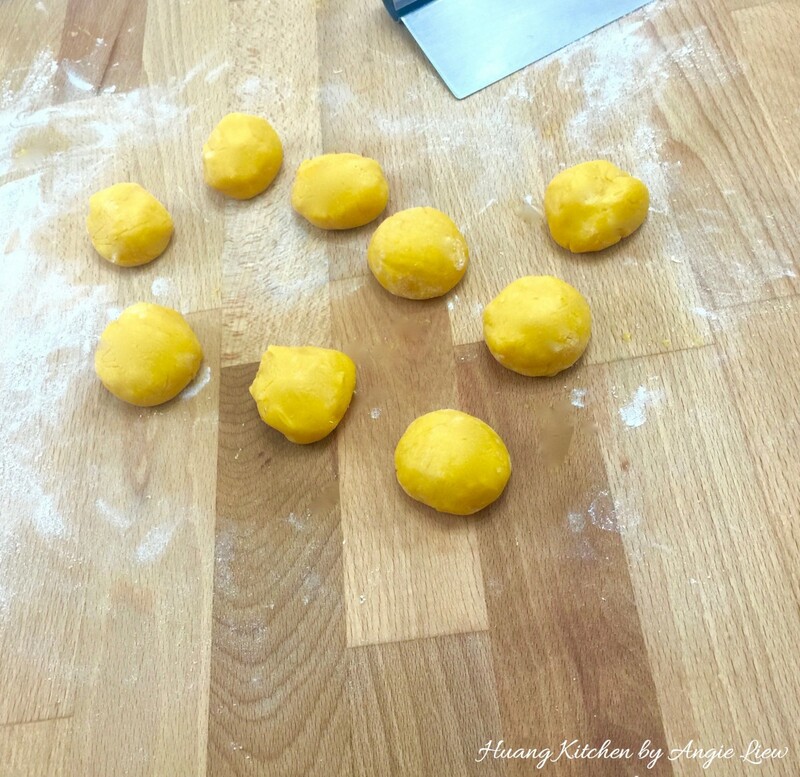 Drain the dough balls on paper towel. Cool thoroughly (about 15 minutes) so that they crisp up before serving with hot brewed tea. As always, ENJOY! 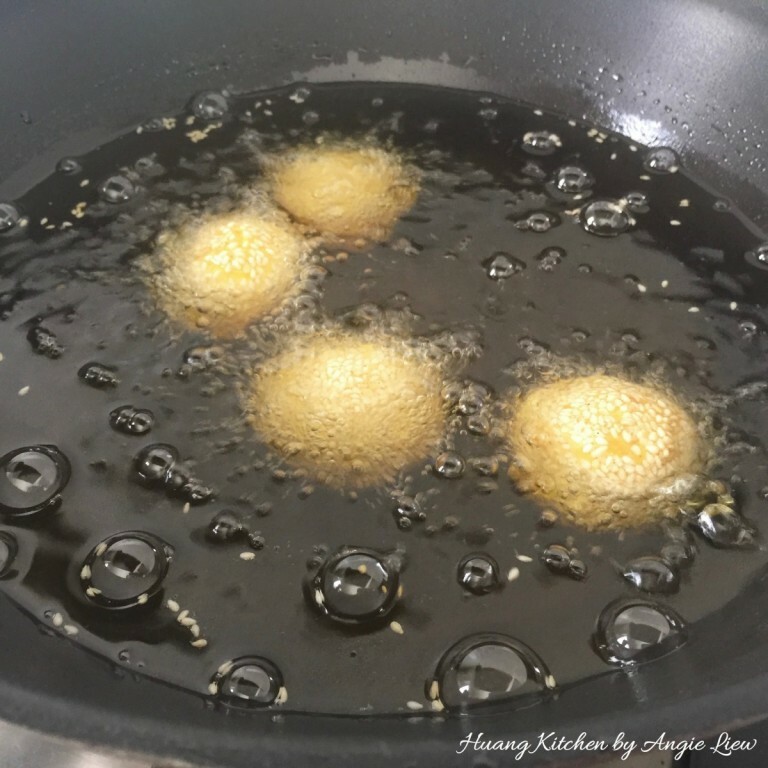 It is important to deep fry the cookie balls in low heat oil. If the oil temperature is too high, the outside of the cookie balls will burn while the inside will still be soft and undercooked. 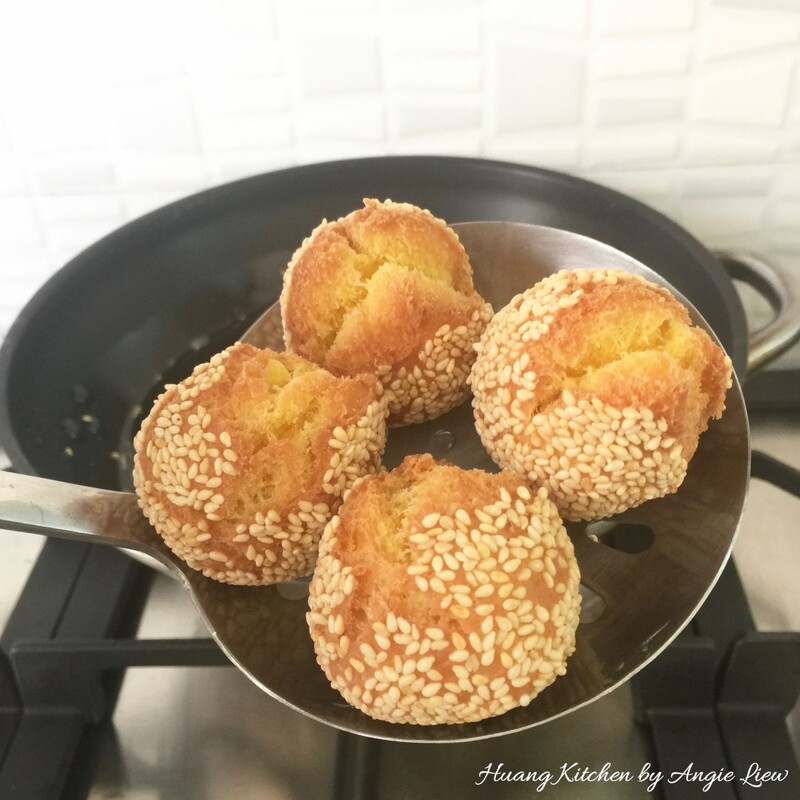 Deep fry the sesame cookie balls in batches to avoid overcrowding. Be sure to roll them around in the oil to ensure even browning. To ensure the sesame seeds to stick to the dough balls, roll them lightly in the palm of your hands before deep frying.